Scoping out the Island for summer clinical! Great trip to Victoria meeting with our clinical site manager. The senior residents are looking forward to PEDEd Foot Care students returning to perform foot care in August. We are looking forward to our 5th consecutive summer serving the island residents along with providing a classroom and clinical experience to the local nurses. Enjoyed strolling the streets of Victoria, visiting the landmarks and of course Beacon Hill park! Registration has begun! You can register at www.pededucation.com to get a spot for the next summer clinical. We are honored to link arms with NightShift Ministries to provide essential foot care to those living on the street who not only struggle with addiction, but also serious health issues. Sandra, a PEDEd nurse demonstrates her determination and serves with all heart as she cuts through a pair of donated shoes enlarging the fit for one of her foot patients whose feet were swollen. Among the volunteers was a lovely young women named Doreen Park, a full time nurse at Surrey Memorial hospital who was introduced to NightShift through Audrey (one of our regular foot care nurses) where she shadowed her on the Community care bus. The seed was planted in Seattle where she volunteered at a homeless foot care program as one of the students who was responsible for just washing the patients feet. Since then, she has been looking for an opportunity such as this one to serve in more care-based volunteer work in the community. 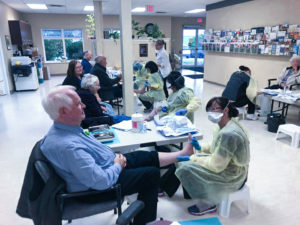 We are so grateful to be a part of this vital foot care program in Surrey and look forward to continuing to work along side of NightShift Ministries, who is also partnering with the Senior Care Society in White Rock. Arrived in Phoenix today for a High Performance Academy conference on business and leadership! Taking my business mentorship with nurses to the next level! Can’t wait for 0900 start for High Performance Academy Conference! Business, leadership, productivity… let’s learn! 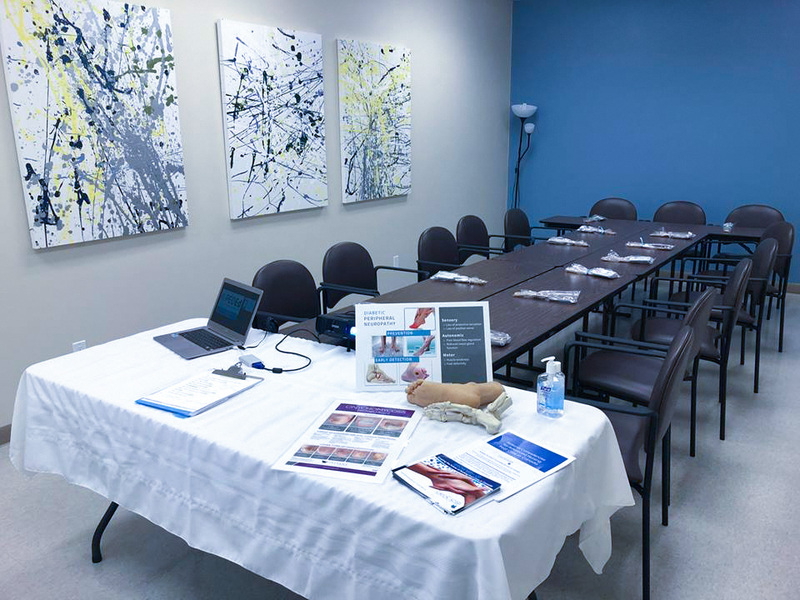 It was a full house on Day 2 of our Spring Clinical at the Senior Come Share Society where foot care nurses put their knowledge and theory skills to practise in a real clinical setting. It was a time of sharing, connecting and caring for the local Seniors in the community as students were observed and mentored by PEDEd’s Instructors; Tannis Sorge and Sandra Tetrault. Hats off to all the keen students for their hard work, enthusiasm and determination to challenge themselves to meet the standard of excellence in the 3-day Advanced Foot Care Course. PEDEd would like to thank the Senior Come Share Society who provided their facility for the 3-day foot care clinical. PEDEd is undaunted by the cold and braves the -31 Degree weather to take an ABI course at NAIT, (Northern Alberta Institute of Technology) We are happy to be back in above 0 temperatures in BC but so worth the frosty toes to glean more footcare knowledge to share with our students! Lots of learning and polishing our skills! And yes…we passed! Great way to kick off Spring with another successful PEDEd Clinical! A great bunch of gals in a full class, eager to learn and soak up all our Foot care knowledge and demonstrations before putting it to practise with one another. We are excited to be a part of their training and preparation for their successful foot care career. PEDEd would like to thank the Senior Come Share Society who provided their facility for the 3-day foot care clinical. REGISTER NOW FOR THE UPCOMING PEDEd ADVANCED NURSING FOOT CARE COURSE! Sandra from PEDEd facilitates a free foot care clinic with two PEDEd Advanced Foot care Nurse graduates Audrey and Monica at NightShift Ministries. Audrey has been volunteering with the Night Shift care bus performing wound care for the street people and recognized the desperate need for foot care. Audrey then took the PEDEd foot care course and is now putting it to good use! Monica completed the PEDEd course in October and jumped at the chance to utilize her new foot care skills. Taya from Come Share Society joined the team where she provided the identification service. Mobile Community Care for Seniors (MCCS) is a collaborative, community initiative to support seniors who are homeless or at-risk of homelessnessin our community. MCCS held a Foot Care Clinic at NightShift Ministries on October 2 and 3, 2018. NightShift is located in North Surrey right on front lines where the most vulnerable, addicted and homeless people are in Surrey. 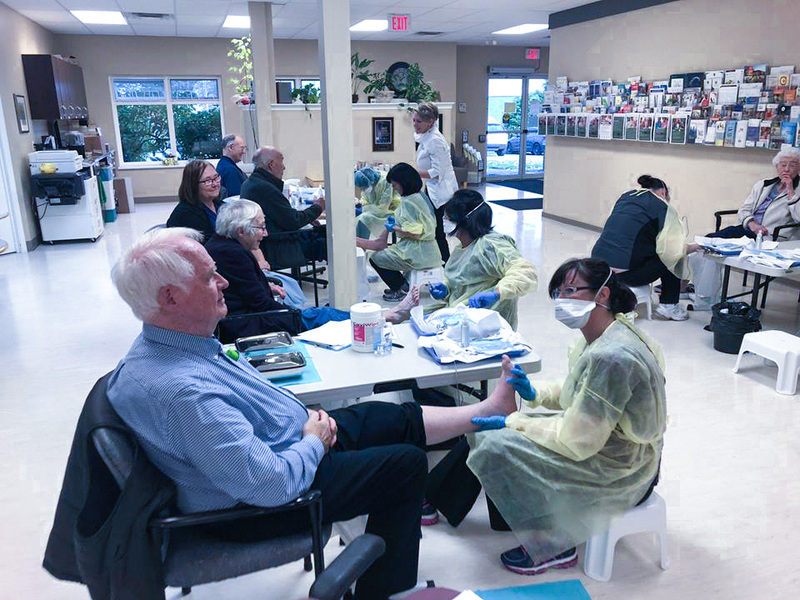 MCCS partnered with PEDEd, advanced foot care practice education, to offer free foot care to seniors who live in the North Surrey area. We want to say a big THANK YOU to PEDEd and the nurses who gave of their time and equipment expense, as well as NightShift Ministries for providing space and open hearts, and Surrey Urban Mission (SUM Place) for their support. PEDEd is keeping our seniors on their feet! PEDEd hosted clinical Oct. 26-28, nurses from all over B.C. arrived to put their knowledge and new skills to work on willing seniors in the community! check out our blog on our website for more pics and stories! Suzanne St-Germain on PEDEd Clinical Coming Friday! !